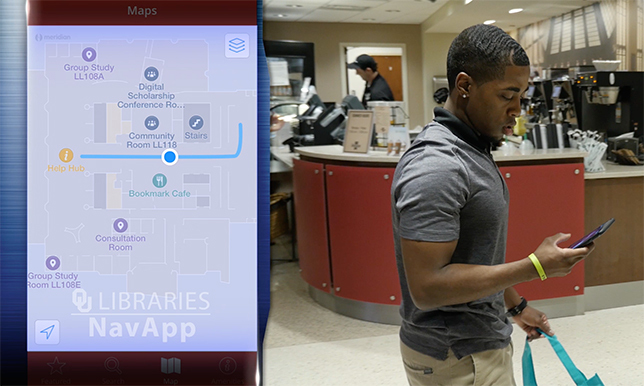 OU Libraries NavApp allows users to navigate library facilities and resources via smartphone. 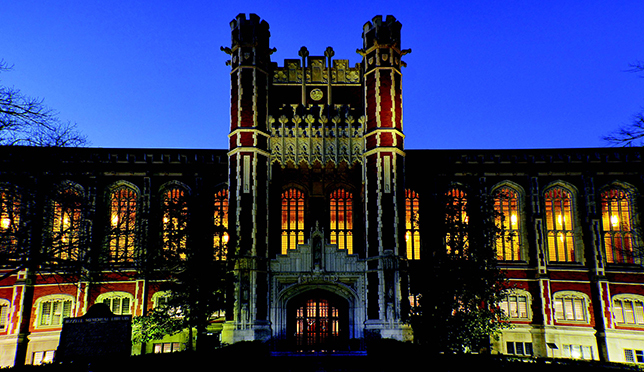 Library facilities can be notoriously complicated to navigate, and the University of Oklahoma's library is no different. "It's an intimidating building, especially for first-time users, which include many of our incoming freshmen, and it's a bit obscure. The resources and services are not immediately apparent when you walk in the front door," said Emerging Technologies Librarian Matt Cook, speaking last August when OU launched NavApp, a new mobile app that provides turn-by-turn directions, location-based information and educational content to help students, faculty and visitors find their way through the university's seven-floor, 400,000-square-foot library system. The development of OU Libraries NavApp began in early 2015, when the university resolved to put an end to the intimidation factor that visitors and new students feel when visiting the library for the first time. The goal: to create a smartphone app that would guide the user by sensing their physical location, and reveal content resources in the user's proximity. NavApp does just that, combining indoor Bluetooth beacons and outdoor GPS to guide users through large indoor environments while providing a plethora of location-based info and relevant push notifications about events, exhibit details, tutorials and more. It was not long before the successful deployment of OU Libraries NavApp paved the way for a system-wide rollout of the technology, beginning with the debut of a virtual/physical exhibit called Galileo's World, an ambitious project with 20 exhibits at seven different locations on all three OU campuses. OU NavApp now vastly enriches the experience of exploring the campus by providing visually rich content tied to the user's location — allowing the user to make a deeper examination of resources and exhibits than he or she would have with the more common practice of viewing an object "through the glass." With access to images created from 3D scans, users can rotate and view fine details of objects on their mobile devices, and they can follow links to much more detailed information on program or exhibit websites. The mobile-friendly content is pushed out "just-in-time," as the user approaches a beacon or stands in front of a resource. Cook, project lead for the OU Libraries NavApp, explained the importance of providing rich content tied to the location-sensitive application: "It's not just navigation — it's content tied to a location; what I call hyperlocal content. As a simple example, once you get to a resource, such as a printer-copier, you may access tutorials or video guides on how to use it. What we hope to accomplish first and foremost is the unification of the digital and physical campus: We can overlay digital resources on top of a physical location. So, instead of forcing the user to navigate a large or complex website, they simply get the content that they are looking for because they are standing at a certain location." The NavApp is powered by Meridian, which is a subsidiary of Aruba Networks, a Hewlett Packard Enterprise company. Bluetooth beacons piggyback on both the existing network infrastructure (RFIP outdoors) and the location services of the individual's smartphone. By overlaying digital representations of building schematics with a corresponding set of "chirping" Bluetooth beacons, OU NavApp can locate users with up to a meter of accuracy both indoors and out. Behind the scenes, OU Libraries NavApp offers administrators, department directors and program managers detailed information to precisely track usage of exhibits, service desks, digital resources, study rooms and more. Key stakeholders are collaborating on the expansion of services and features. OU Libraries staff members plan to build on partnerships around campus and work closely with central campus IT to integrate functionality into the primary campus app or build out a fully customized campus NavApp where needed. New features like catalog searches and emergency notifications have been requested by both by users and administrators. The combination of strong user engagement and detailed usage data is providing much-needed background for program planning and the growth of the NavApp on campus.